Tis the season for Weddings! I've been busy booking more clients now that it's a new year and i'm graduated from school. 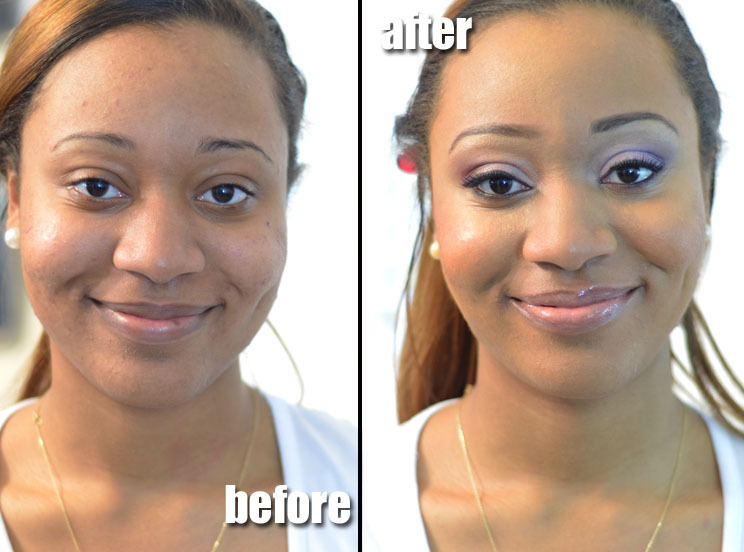 I wanted to share a pretty fresh bridal makeover I did recently. Yay for more before and afters! My bride is a very light makeup wearer. She wanted to look like herself but a little more enhanced. Her mother was also there during the trial to give input. We first started with a champagne and brown neutral look but then switched to pink and purple (always a pretty combo) for a bit more color and fun. I used a pink eyeshadow from Stars Makeup Haven. I convinced the bride to rock a natural pair of falsies to give some oomph. She was resistant at first but then loved them. I used my favorite bridal pair of 747s lashes. As a makeup artist, your job is to work with your client to find what's best for them. Remember, makeup is only temporary so it's fun to at least try new things. We finished the look with a pretty pink lip. She wanted extra shine so I used MAC's original clear lipglass on top. I'll share the pics from the June wedding soon! her skin looks absolutely flawless! love it! Love the look Ren! Where do you get the 747 lashes from? I hope to see you at the makeup show. You've been such an inspiration to me.